Automotive garages process many litres of fluids every week. Some of the fluids are simply water-based, while others are oil-based. These oils often require special types of pads that will resist water and only absorb the oil based fluids. In fact, garages are often subject to inspection to make sure that oil-based liquids are soaked up appropriately and quickly in the proper manner. That is when TIDDOX's AUTOMOTIVE "OIL ONLY" ABSORBENT PADS can save the day. These pads are water-resistant, shedding water while retaining any oil that comes in contact with them. All oil-based chemicals and solvents, such as fuel, diesel, chemicals and solvents, are absorbed and retained by the pads. Each pad will hold up to one liter of oil! Once the pad is saturated, you can dispose of it in the required method. These pads are made of polypropylene that has been meltblown, which creates a super-absorbent material that soaks up any oil-based floor spill. Fuel, diesel, oil, chemicals, and solvents all stay in this material until you are ready to dispose of it. The pads are durable, too. Once they are saturated, you can pick them up and dispose of them without them tearing apart or dripping all over the floor. This is a low-lint material, which also helps reduce the amount of debris left behind. 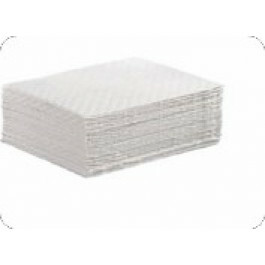 You can use these pads at your workspace and move them to the next workspace to use until they are saturated without worrying about them coming apart when you pick them up. Our customers also like the oil only absorption rolls which tear off like paper towels. Order a pack of 100 OIL ONLY ABSORBENT PADS today, and you will see just how much money they can save you. A similar, cost effective option are the cartons of 200 SUPERMAX ABSORBENT PADS which are big enough to protect a large area. Alternative options include the TIDDOX AUTOMOTIVE GENERAL PURPOSE PADS and OIL ONLY ABSORBENT ROLLS.